Iranian Authorities Continue Brutal Oppression: Is This the Beginning of the End? Today has been a pretty crazy day in Iran. The authorities decided to use deadly force on a holy day, and the nephew of Mousavi, who was in the line of the Imam, was murdered. Both of these have serious cultural implications, and are likely to attract even more people to the revolution who have previously been standing on the sidelines. I highly recommend Andrew Sullivan's blog for frequently updated information on what's going on. Whole Foods CEO John Mackey got himself in a lot of trouble earlier in the year when he wrote a letter arguing against health care as a human right and claiming that the way to fix the system was to remove "government control." As a result of Mackey's letter, Whole Foods (already known for unethical union busting tactics) came under a lot of pressure from progressive groups. Many people have boycotted Whole Foods since his letter. And as a response to that campaign (or rather, as a pretend response to that campaign), the tea party called for a "buycott" of Whole Foods where they would start shopping there to support the CEO's "courageous" stance and, of course, "free speech" (unsurprisingly the same people who love Mackey's "free speech" recently called for a boycott of Build-a-Bear for acknowledging the scientific consensus that climate change exists, so it's hard to take their love of "free speech" too seriously). The TPs exaggerated and manipulated their numbers to make it seem like their buycott made a big difference, and as a result they got a fair amount of media attention. And I wrote at the time that their campaign had absolutely no chance of actually helping Whole Foods, and furthermore that they didn't really care about helping Whole Foods since their only goal in this was to create a political stunt that allowed them to make a few extra anti-healthcare reform remarks to the local media. I think this point has been validated recently. John Mackey is giving up the title of chairman of Whole Foods, specifically because of concerns that he's tarnished their image. Now it's true that he's still their CEO and on their board of directors, so no one who was boycotting should rush out to go shopping there, but this action still shows that his letter was unmistakably harmful to the company as the company is taking actions to make it look like they're punishing Mackey. If the "buycott" was successful, Whole Foods wouldn't be taking actions to punish Mackey or make it look like his role in the company is diminished; they would be putting him out front and center. But, as I said, the buycott was never about actually helping the company, and it never had any chance of significantly affecting the company, whereas the tarnished image of Whole Foods among liberals is unquestionably harming their bottom line. Of course, the TPs don't care. This was just one of a long string of unprincipled publicity stunts for them, and if Whole Foods went out of business tomorrow, they wouldn't even bat an eye. I have been amazed at the rancor and deceit that many politically “right wing” and conservative leaders have demonstrated during the long, heated struggle to pass health reform legislation. I’m amazed that for political, partisan and ideological reasons, Republicans and Libertarians are willing to lie to their own voters. I’m awestruck at the monumental steps people are taking to protect corporations, defend outrageous profits and protect a status quo that working people in any political party cannot afford much longer. Of course, we expect that sort of vitriol and cynicism from the right wing and from conservative political operatives who have lost ground in the last election and are bitterly losing the health care fight. I am having a much harder time understanding the fierce attack by some folks who are thoughtful, independently-minded and progressive. Like any significant human and civil rights struggle, we are in a place where we’ve won a lot, we’ve lost some of our demands, and there’s more work to be done to get a final bill out of conference. Both the House and Senate health care bills represent an incredible step toward real, affordable, quality health care for every person in our country. Neither of them accomplish everything we need. 2. The proposed expansion of Medicaid will provide a lifeline to 15 million low-income and disabled Americans. Congress is about to enact a significant expansion of Medicaid for both individuals and families up to 133% of the federal poverty level. Currently in Missouri a family of three is eligible for the state health insurance program if their income is less than $292 a month. Both House and Senate bills lift the income rules for the whole country to about $2029 a month for that same family of three. For the first time adults without dependent children will get this coverage. These 15 million uninsured, low income individuals will gain insurance through a public health insurance program that is affordable and has very nominal out of pocket costs. This provision will help laid-off workers and part-time workers. This expansion will revolutionize life for people with disabilities and people living with mental illnesses. For many of us, when disability strikes, we will no longer have to prove that we are “permanently and totally disabled” and unable to work just to have access to the public option of Medicaid. We won't have to stop working just to get health care. 3. Corporate abuses are curtailed and health Insurance companies have been significantly pushed back in both bills. The Senate bill went much farther than we imagined in reining in insurance company abuses. What’s really in the Senate bill? Insurance companies will not be able to turn us down or charge us more if we have pre-existing medical conditions. Insurers will be required to spend 85 cents out of every dollar they receive in premiums on health care rather than profits and administrative costs. If not, people would receive rebates from their insurance companies for the difference. Insurance companies will be banned from issuing policies that have lifetime or annual limits on benefits. Consumers gain the right to an independent appeal of any decision by an insurer to deny coverage. 4. Both the House and Senate bills bill create a national, non-profit, publicly accountable option for health insurance coverage. The House bill contains a national public insurance option. However, even in the Senate bill, people purchasing insurance in the Exchange will be able to choose from national plans, including at least one non-profit plan, supervised by the same department of the federal government that selects health insurance plans for federal employees. Before the recent invention of a “public plan” demand, progressive health care activists were asking Congress to either open up Medicare for all or allow people to buy into the plans administered by the Office of Professional Management—the same plans that Congress and Federal employees have. We just won a long-standing demand. 5. We cannot “start over” and get more progressive reform through Congress any time soon. Getting landmark legislation passed is a treacherous, long chess game, especially when that legislation has powerful corporate enemies or extends significant civil and human rights. Unprecedented political capital and economic capital have been spent—the years spent making health reform a key issue in the last election, the storybanks, the canvasses, the phone calling. We all put our best game on the field. It’s time for a final push to improve the legislation in conference committee and to plan on how we will take this momentum and build and expand on our victory. Many leaders in the health reform movement predict that if health reform fails now, we will not have another meaningful effort for 15 to 20 years, if at all. If health reform fails now, the insurance companies and for profit health care corporations will laugh (at us) all the way to the board room. This fight has been long and vicious because Congress is creating federal rules that make insurance companies behave. Insurance companies are going to be regulated, and they don’t like it. So much is at stake. It is very dangerous to forgo these incredible victories because they are not far enough, especially since losing means millions of struggling Americans will have to continue in the health care system as it is for many, many years. I’ve spent the last three years talking to hard working people throughout Missouri who will get real, measurable, concrete help from these legislative changes. For some of them, their lives literally hang in the balance. We have a responsibility to stand beside and for the uninsured working people who will gain much from these bills. As a few progressive groups send emails around to “kill the bill” (along with the tea party) or “a bad bill is worse than no bill,” insurance companies and right wing political operatives throw fuel on that fire. All of us should deeply consider the consequences of squandering this opportunity to move our health care system several strides forward. Kill the bill, and insurance companies win. I believe we are better than that. Monday, Dec. 21, The County Council is having their final vote to decide whether to put funding for public transit on the April 6 ballot at their 3 PM meeting. Please contact the County Council and let them know you think voters should have a chance to decide to keep our public transit system at full funding! And, if you can attend the meeting and show your support, please do. Tuesday, Dec. 22, there will be a fundraiser for St. Louis native Jasmine Crockett who is running for District Attorney in Texarkana, TX. The event will be at the EXO Restaurant and Lounge at 3146 Locust from 5:30 to 7 PM. Wednesday, Dec. 23, the Mad Art Gallery (2727 S. 12th St.) is hosting the 4th Annual Christmas Improv Jam featuring Bill Chott at 7 PM. The event raises money for America's Second Harvest and the St. Louis Food Bank. Also Wednesday, 15% of sales from pizza at Racinelli's will go towards the United Way of St. Louis's 100 neediest cases. Find out more here. Also Wednesday, Barry Rosenberg, who teaches non-profit management at Washington University, will be speaking about his experiences in the non-profit world as part of Next Dor St. Louis's Local Leader Series. The event goes from 6:30 to 9:30 Pm at 5062 Waterman. Saturday, Dec. 26, Schlafly Beer is turning 18! Celebrate at the Schlafly Tap Room (2100 Locust) from 9 PM to 1 AM. Saturday and Sunday, it's Bald Eagle Days bright and early at Pere Marquette State Park in Grafton, IL. Get there by 8:30 AM and have a chance to do some eagle-spotting along the river. Sunday, Dec. 27, and every Sunday, the St. Louis Instead of War Coalition holds a candlelight vigil for peace at the corner of Grand and Lindell. Tony Messenger is a top notch reporter at the Post-Dispatch. He has tenaciously covered scandals on both sides of the political isle, hounding former Governor Matt Blunt when he flaunted the sunshine law and later reporting extensively on the E. Coli scandal for Governor Jay Nixon. And since Messenger has a professional code of ethics where he applies the same standards to both political parties, it is of course inevitable that he will be accused of being a Marxist with a liberal bias by right-wing activists who think that Fox News's ideological ranting is the model for what all news should be. Get that? Durbin says, "maybe it's the topic, or the new sources," as in, "maybe you're being mislead by liberally biased sources even if you personally aren't biased." But of course the reality is that neither the topics, nor the sources, nor Messenger are biased. Durbin just won't accept any reporter who doesn't carry water for the Missouri Republican Party. Even as Durbin is forced to acknowledge that he can't provide any support for his claims that Messenger is biased, he still secretly believes that he's right. Sadly, political evaluations are all too often like this (and not only on the political Right): people have a gut feeling first, and search for any evidence they can find to support that feeling. Sometimes, as Durbin illustrates time and time again, they'll cling to the feeling even when they can't find any evidence whatsoever. 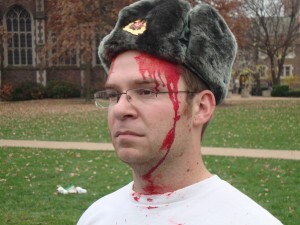 If you don't recall, Jon Burns was the charming fellow who said that maybe the students at Washington University were "in a gulag all along" after the university shut down a display by the Young Americans For Liberty (YAL) on campus, and then promptly went on to try to disrupt the free speech of another group a couple weekends later. 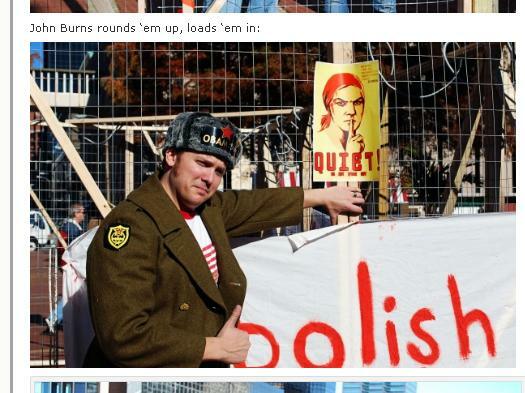 After the gulag display, Burns was paraded around the local right-wing media as the leader of YAL, who generally forgot to mention that he wasn't actually a student. Most recently, he went around claiming that YAL had been framed for the hammer and sickle graffiti that mysteriously appeared on campus the day of their event. A quick perusal of our Web site, however, reveals that Burns is neither a member of YAL nor a student at Washington University, but rather the owner of the construction company which erected our gulag. In other words, Burns, the guy paraded around by Dana Loesch and Gateway Pundit as the "leader of YAL," isn't actually a member of YAL. I'm sure they'll be issuing a correction soon. Will Jim Durbin and Dana Loesch Apologize for Lying About Patricia Reddington? Right-wing bloggers Jim Durbin and Dana Loesch (writing on Breitbart's Big Government site) have gone completely off the rocker in their allegations of massive conspiracy regarding the incident between Kenneth Gladney and Elston McCowan. In addition to alleging, with no evidence whatsover, that this altercation was the result of a intimidation campaign ordered by the White House, SEIU, and Health Care for America Now, they have suggested that the only reason McCowan wasn't tried with a felony is because of a coverup at the local county prosecutor's office. Redington's office never even looked at Gladney's medical records before downgrading charges. St. Louis County Prosecutors watered-down the charges in the Kenneth Gladney case from a misdemeanor to an ordinance violation without so much as even calling St. John’s Hospital, where Gladney received treatment for his injuries, and checking Gladney’s hospital record or speaking with care providers on site. During our conversation with Redington, I asked when she had received Kenneth Gladney's medical records. I had read that his medical records had not been reviewed, yet I had heard on the radio that Redington's office had seen the records. She told me that she had received them with the police report. I was left with the impression that it is common practice for medical records to be submitted as evidence along with police reports. In other words, Durbin and Loesch asserted both false and damaging claims as if they were facts, without even bothering to find out the truth. And even since it was revealed that the office did see the medical reports, neither has had the common decency to admit that they falsely accused the County Counselor. Of course, they live in a world where they simply invent conspiracy theories, slander everyone who disagrees with them, and then simply move on without a second thought when their wild-eyed theories are proven wrong. That's how the right-wing media works, both on a local and national level. (1) Passing the bill does not achieve the most important reform: reining in the costs of insurance. The public option was the only legitimate way of reigning in costs, since it took out the profit motives and provided competition against the industries that have shown no respect for human life. Without a public option, insurance companies can continue to raise premiums without any consequence. Since healthcare is an essential need that all of us have, these insurance companies basically have a monopoly on an asset that we need to survive. (2) What's worse, this bill actually mandates that people buy private insurance. That means that it forces individuals to give their money to the same companies that have been screwing us over for years. And federal taxpayer money will also be used to supplement these mandates. In other words, we are GIVING BILLIONS to the insurance companies, who will inevitably use this money to fight against any future reform. So this bill would actually make it harder to pass meaningful reform in the future. (3) Joe Lieberman has lied repeatedly without consequence, and has proven that he only cares about his self-interest. Since he only cares about his self-interest, he will throw hissy-fits like this on any meaningful legislation from here on out. In other words, if Democrats always capitulate to LIeberman, and Lieberman always cooperates with greedy corporations, then the Democratic Party will NEVER pass any substantial legislation that challenges the control big money has over our government. Passing a crappy bill now would send a signal that we're never going to stand strong on any meaningful reform, which of course will provide corporations with an obvious roadmap for defeating future needed reforms (such as climate change legislation or the employee free choice act). So that's why I believe that LieberCare is worse than no reform at all. I believe that it actually is a step in the wrong direction. And I'm not alone; both Howard Dean and Markos Moulitas have both said that we should kill the current bill. Also, as usual, contact your Senators and Representatives AND the White House and tell them that we won't support a bill that's not meaningful reform, and that means we need a bill with the PUBLIC OPTION! There's no excuse for continuing to let people die due to a compromised insurance industry. Even though it looks hopeless, please join me in fighting until the end! Thursday, Dec. 17, there will be a gallery talk on the theme of Religion and Violence at the St. Louis Art Museum by Professor Frank Flinn at 11 AM. Tuesday, Dec. 8: From 5 to 8 PM, shop at the U (3108 Olive) and 10% of your purchase will benefit the St. Louis Animal Care and Control Volunteer Group. Also Tuesday, join World Talks at Wash U in McMillan 149 from 6 to 7 PM as they speak with Chilean students. Also Tuesday, there's a Holiday Happy hour for Honduras sponsored by Engineers Without Borders from 6 to 9 PM at the Old Rock House (1200 S. 7th Blvd). Also Tuesday, the 17th Ward is having a Holiday Party and Awards Ceremony from 6 to 9 PM in the Library Annex of the Spring Street Lofts, 3693 Forest Park. Also Tuesday, volunteer organization FUEL is holding a Holiday Wine Party starting at 6 PM at the Duane Reed Gallery (4729 McPherson). Also Tuesday, Amnesty International is doing some Holiday Letter-Writing for political prisoners from 7 to 8:30 at Bethel Lutheran Church. Also Tuesday, the Harris Stowe State University Men's Basketball program is raising money for the United Way at their home opener. Wednesday, Dec. 7, is the last day to help out with the December Naral Mailing Party. Also Wednesday is the always fun Scrooge of the Year (formerly Grinch of the Year) Party hosted by Missouri Jobs with Justice. Have a great time while voting for this year's worst Scrooge! The event is at Teamsters Local 688 (4349 Woodson) from 5:30 to 9 PM. Also Wednesday is Cocktails for a Cause at the Over/Under Bar and Grill (911 Washington) from 6 to 8 PM, raising money for the Foster and Adoptive Care Coalition. Also Wednesday, participate in the Global Education Day of Action by attending an informational meeting at the Webster University Clubhouse (520 Garden Ave.) from 6:30 to 8 PM. Thursday, Dec. 10, join the Health Care is a Human Right Rally at 5850 Delmar from 10 AM to 1 PM. Also Thursday, Citizens for Missouri's Children are having a Holiday Happy Hour at Llywelyn's Pub (1732 9th St.) from 5 to 7 PM. Also Thursday, there will be a fundraiser for progressive Alderman Shane Cohn at 4161 Gravois from 5:30 to 7 PM. Also Thursday, the Webster University College Dems will be phone banking for health care reform. Also Thursday, the St. Louis Coalition for Human Rights is presenting their awards for the 13th annual Human Rights Essay contest is is holding a discussion of Health Care As a Human Right at 7 PM at the MO History Museum. Also Thursday is the premiere of Homolatte Saint Louis at Urban Eats (3301 Meremac) from 7 to 8:30 PM. This will be followed by the also exciting SpeakOUT! Also Thursday is the December meeting for NORML, taking place a Mokabe's (corner of Grand and Arsenal) at 7:15 PM. 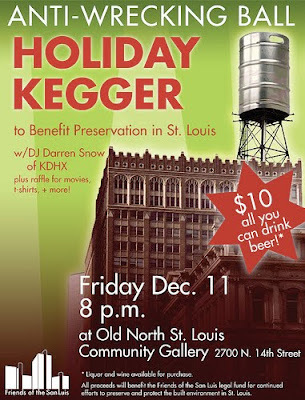 Friday, Dec. 11, enjoy yourself at the Anti-Wrecking Ball Holiday Kegger to Benefit Preservation in St. Louis, held at the Old North St. Louis Community Gallery (2700 N. 14th) from 8 PM to 2 AM. Saturday, Dec. 12, there will be a Creative and Liberating Liturgies Workshop at the Center for Theology an Social Analysis (1077 Newstead) from 10 AM to 3:30 PM. Also Saturday, join Greenpeace from 10 to 2 as they participate in the International Day of Action for Copenhagen. Sunday, Dec. 13, join Rally #3 at the Cathedral Basilica (4431 Lindell) for the "separation of Church and Hate" hosted by Show Me No Hate from noon to 1:15. After that rally, discuss LGBT issues in the church at the Center for Theology and Social Analysis (1077 S. Newstead) from 1:15 to 2:30 PM. Also Sunday, there will be a Walk for AIDS Treatment starting at the Gateway Arch at 2 PM. Act now to save ENDA! Bad news: ENDA has been shelved. Congress is putting off voting on ENDA (the Employment Non-Discrimination Act) until the beginning of 2010 -- when election-year pressures will make it harder than ever to get this important legislation passed. It is unacceptable that today -- in the 21st Century -- it is still legal for employers to discriminate on the basis of actual or suspected sexual orientation or gender identity. This is the state of affairs in a time when unemployment is high and jobs are hard to come by. In 29 states, it's still legal to fire a person because of their sexual orientation, and in 38 states, it's still legal to fire someone for their gender identity or expression. I know you've heard these statistics before, but please take a moment to really think about them. Legalized discrimination against any minority in 2009 is simply absurd. And now I hear from my friends in the LGBT community that Congress is willing to let the discrimination continue into 2010, when election-year pressures may make it more difficult to get ENDA passed. Over the course of our history, Americans have made great strides in fighting the egregiousness of institutionalized oppression. Anyone who still supports racial segregation, for example, is rightfully marginalized in today's society as reactionary and bigoted. The American people have finally overcome enough deep-rooted prejudice to elect a qualified man of a mixed racial background to the office of U.S. President. Even so, to say that our society is "post-racial" is laughable at best, but at least no respectable American would suggest that we return to a state of blatant, legal racial discrimination. The Reverend Dr. Martin Luther King, Jr. said in 1967 that "the arc of the moral universe is long, but it bends toward justice." That is true, but we've waited long enough. Dr. King also said that "the time is always ripe to do right." Please do your part to create a more just society now by supporting ENDA (H.R. 3017 / S. 1584) and bringing this important bill to a vote sooner rather than later. Thank you, and may you have a warm and happy holiday season. Last weekend at the St. Louis nightclub the Complex, three young men were approached by four men from another bar who called them "f------" and then attacked them because they're gay. Also last weekend, a woman who uses a wheelchair was raped and robbed by two men near a gas station in Ladue. In response to these vicious crimes, local activists in the LGBT community have organized a candlelight vigil, march and rally to be held Friday, Dec. 4, at 7 p.m. along Manchester Ave. Speakers at the rally will include Sen. McCaskill, the Mayor's office, Rep. Clay, the NAACP and others. Violence happens everyday to women, African-Americans, Latinos, Jews, transgendered, children, disabled, senior citizens, Natives, Muslims, homeless, Christians, gays, lesbians and many others who suffer at the hands of an abuser. The vigil, march and rally are part of a united St. Louis effort to respond to all violence. The schedule for these events can be found at the Show Me No Hate website or the event page on Facebook. Participants are asked to wear red to show their solidarity with those who have been victimized. In addition, after the rally, the NO H8 Project will be holding a fundraiser at 8 p.m. at Nancy's Place. There will be a free concert by jazz/blues legend Kim Massie, and donations will be solicited to help pay the medical bills of hate crime victims Jacob, Mitch and Omer, who have no health insurance. Another benefit for Jacob, Mitch and Omer will take place at 10 p.m. at the Complex (3515 Chouteau Ave.). There will be a show featuring Dieta Pepsi and others, and then dancing until 3 a.m.
To Benefit Preservation in St. Louis. 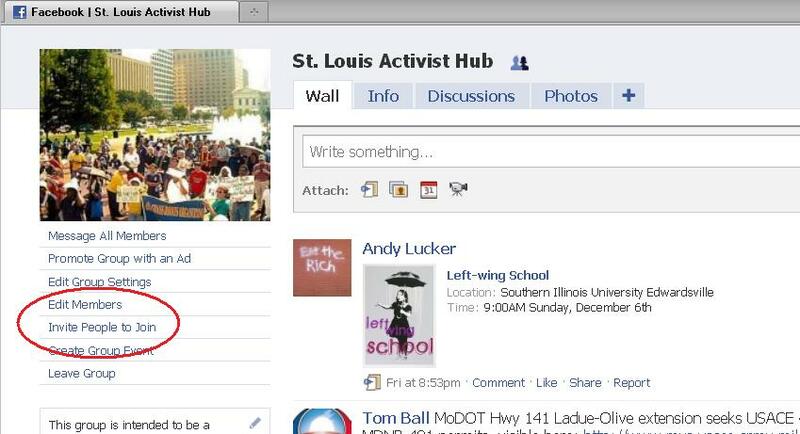 Via Vanishing STL..
John Burns, the owner of a local construction company who built a gulag on the Washington University Campus in cooperation with the university chapter of Young Americans for Liberty (YAL), recently attended the Show Me No Hate rally outside of the St. Louis Cathedral Basilica along with take-videos-out-of-context-then-selectively-edit-them-and-refuse-to-release-entire-videographer James O'Keefe and another friend. His group attempted to disrupt the rally and then groped each other for a while, but fortunately the rally organizers recognized them early on and were able to keep them from disrupting the events. All the local right-wing bloggers predictably were upset about the gulag being taken down. And they furthermore spent a lot of time interviewing Burns about it. But, during all of these blog posts, they someone forgot to mention that Burns is not actually a student at the university. In fact, they pretty much systematically introduced YAL as a student group and then described Burns as a leader, despite the fact that Burns is not actually a student. Not the world's biggest scandal, but worth noting nonetheless. And of course the guy in the striped shirt is James O'Keefe. And how did they act at the rally at the Basilica, which was a rally to protest the local Catholic Church using $10,000 to ban gay marriage in Maine? According to people who were there, they originally posed as being in support of the rally. However, after they were handed a sign, they wrote "Free Abortions" on the back and tried to hold it up for people attending mass. Fortunately, protest organizers were able to block them. Then, when Ed Reggi was speaking, they kept yelling"What about health care!" which had nothing to do with the message of the rally. O'Keefe screamed something about an old lady assaulting him. And, in their grand finale, they started groping each other. “I guess the students at Washington University were in a gulag all along, and the administration proved it through their stifling of free speech,” Burns said. Well, I guess Burns cares so much about free speech that he tried to distort a peaceful message from people who are fighting for their civil rights. Right wing hypocrasy at its finest. 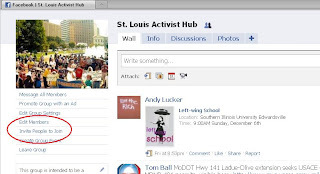 Invite Your Friends to Activist Hub! Hi, if you think the Activist Hub is a helpful guide to weekly events and other useful information, you can invite your friends to the group really easily. It only takes a few clicks to invite all of your facebook friends in a network. Then just click "Send Invitation." It's that easy, but it can make a big difference. If you have a chance, please take the time to help keep progressives and activists in St. Louis connected, so that we can all work together for a better St. Louis! Thanks! BREAKING: Harris Himes Changes Story! Big Time! Right wing blogger Gateway Pundit interviewed Harris Himes, who was one of the witnesses who claimed to have seen Elston McCowan and Perry Molens's "assault' of Kenneth Gladney outside of Russ Carnahan's townhall on August 6. And let me tell you, if you've been following this story, the interview was a doozy! Witness H. Himes stated that as he was leaving the school gymnasium, he saw Suspect McCowan talking to Victim Gladney. He stated he saw Suspect McCowan reach over the table and punch Victim Gladney in the face. This assault knocked the victim off balance. Suspect Molens then went around the table and pulled Victim Gladney over the table backwards by the back of his shirt collar. He began to punch and kick Victim Gladney. Witness H. Himes added that while Suspect Molens was kicking and punching Victim Gladney, Suspect McCowan then joined in on the assault. And so I looked back because I heard a noise behind. And, it was my wife however, who could corroborate the fact that it was really a hate crime because she heard the black man who claims he's a minister also said "what's a ..... doing here" ... that was essentially what she heard. And I looked back and then I saw this guy slap Gladney...slap his hand away and start striking him but the other big white guy grabbed him and threw him down to the ground. So I came back, and I was trying to get them off Gladney, and my wife was circling to keep any of the others from jumping me. And so then we got them off and broke it up once and then they attacked him again. " This is radically different than the initial story. First of all, Himes admits that he did not see how the fight started, even though the original police report suggests that he did. Second, he now claims that he first saw McCowan "slap Gladney's hand." In the original police report, he claimed that McCowan had reached "over the table" and punched Gladney. The fact that he said he saw him slapping Gladney's hand is especially significant since one of the original questions I raised was why Gladney says, at 0:43 of the original video of the altercation, "why'd you hit my hands?" If Gladney had just been beaten up, why would he ask about his hands? Likewise, if Himes had witnessed Gladney being severely beaten, why would he talk about his hands getting slapped? This of course dovetails with the with strangeness of the fact that Gladney was clearly walking around and looked uninjured in the original video, but then showed up in a wheelchair purportedly unable to walk or talk a few days later. Furthermore, Himes then says that he he saw Molens come over and throw Gladney, "to the ground." But of course, this is the part we already saw in the video (when Molens is pulling Gladney, who looks like he's about to throw a punch, away from McCowan who's laying on the ground) , while the official right-wing story is that the alleged assault happened before the video. In other words, from what I can tell, basically all Himes witnessed other than a "hand slap" is the same thing that we saw on the video! Witness #2, Sandra Himes', statement of the incident concurred with Harris' account of the incident. She did add that Victim Gladney did nothing to provoke this assualt. Well, actually my wife had stopped to look at the buttons and the flags he was handing out, and just as she turned away, that's when he was attacked by the two SEIU guys..."
In other words, she did not see how the fight started either, because she had "just" turned away! But, again, this is in direct contradiction to the police report, which implied that she was a witness to the actual events. Furthermore, his story doesn't say anything about the two other people who Gladney and David Brown claimed also attacked Gladney. In other words, Harris Himes has just told a story that contradicts the testimony of two of the three witnesses who claimed that Gladney was brutally beaten. I really hope the county prosecutors had some better evidence than what was presented in the initial police report when they decided to file charges, because so far I don't see how Elston McCowan could be charged with anything. Bonus Link: While I was digging around for this story, I found a couple more falsehoods from Brown and Gladney. First, David Brown claims in an interview with Faux News that he witnessed the entire event (3:34), despite the fact that you can see that he walked over to the scene during the video, only after picking up his stuff and putting it in the car. And (3:23) Gladney claims that "i got up, kinda dazed, looking for my glasses, and then one guy was coming at me again and that's when the police came in" when the video clearly shows this to be false. No one was "coming after' Gladney when he was looking for his glasses. This story is so ridiculously full of holes! Tuesday, Dec. 1, Nobel Peace Prize Winner Elie Wiesel will be speaking at Saint Louis University, in the Wool Ballroom of the Busch Student Center, at 7 PM. Doors open at 6:30. For an challenging take on Wiesel's moral outlook, read Micheal's earlier post. Wednesday, Dec. 2, there will be a protest of the Stupak amendment on the corner of Chestnut and N. Broadway from 8 AM to 9:30 AM. Thursday, Dec. 3, there will be a Cocktails for a Cause happy hour at Miso on Meramec where donations go to the World Food Program from 5:30 to 6:30 PM. Saturday, Dec. 5, a new program called World Talks has organized an opportunity for students in St. Louis to speak with students in Uganda. The discussion will be in McMillan 149 on the WashU Campus. Also Sunday, there's a Book Fair Fundraiser for the Jewish Fund for Human Needs from 10 AM to 9 PM at the Borders in Creve Coeur (11745 Olive). It's not hugely shocking to hear that the Tea Parties across the country have been massively overestimating their attendance at events since they first started. But Sean over at Fired Up had a great catch recently. 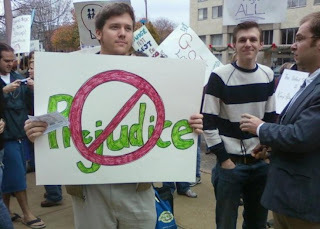 The St. Louis Tea Party has repeatedly claimed that they had over 10,000 people in Keiner Plaza for their April "Life's Not Fair Because We Hate Paying Taxes" rally. This is pretty darn amazing, considering that Keiner Plaza only holds 3,000 people. So unless there were about 7,000 C.H.U.D.s enjoying the rally from underneath Keiner Plaza, we probably should continue to take all of their crowd estimates with a huge grain of salt. Is Elie Wiesel Truly a Moral Authority for Humanity? On December 1, Jewish Holocaust survivor, author and Nobel Peace Prize recipient Elie Wiesel will speak at St. Louis University. Wiesel has been called a prophet and a voice for humanity, but I think it is instructive to look at Wiesel’s actions of one month ago to help us truly assess this man’s moral authority. Although Wiesel has spent his life condemning anti-Semitic ideas like those of Hagee, he offers only praise for the televangelist. Why? Wiesel supports Hagee because Hagee supports the government of Israel. Hagee leads Christians United For Israel, America’s largest and most powerful Christian Zionist organization. He organizes evangelical Christians to support Israel’s expansion of illegal settlements in the West Bank and Jerusalem. He defends Israel’s recent assault on Gaza, which reduced much of Gaza to rubble and killed 1,400 Palestinians, one third of them children. Hagee supports Israeli actions because he believes Jews must fully inhabit the Holy Land for the final apocalypse to come and bring destruction to the world and salvation to true Christians. Wiesel supports Israel because as a Jew he feels a religious and national connection to the state. Wiesel is willing to ignore Hagee’s anti-Semitic and apocalyptic views because he thinks it will further his goal of promoting Israel. The idea of one needing to have previously supported a state to have the credentials to criticize it is a bizarre intellectual and moral principle. If someone applied the same principle to North Korea or Cuba or Russia, no one would take the person seriously. Throughout the same interview Wiesel and Hagee criticize Iran and Saudi Arabia, without either demanding that the other present the proper credentials to do so. But he will not speak out against the longstanding and well documented killings by the Israeli military of innocent people and helpless children, and accepts at face value the justifications for the killings given by the Israeli state. Elie Wiesel condemns those who condemn Israel’s increasingly brutal violations of Palestinian people in Gaza and the West Bank. Wiesel asks other people to put aside ethnic and national loyalties in order to protect basic principals of human rights, but he refuses to do so himself. People should think about that while he speaks at St. Louis University this Monday. The Post-Dispatch has the details. Interestingly, reporter Jake Wagman was charged with "interference," which seem pretty questionable given the video. And McCowan and Molens are charged with both misdemeanor assault and, "interfering with police." It seems like the video, which didn't capture the original altercation, should tell us quite a bit about the claim that they were "interfering with the police." Reached about his own case, Molens said, "These charges are ridiculous." He added, "All I was doing was coming to the help of a friend. I don’t know what evidence they’re basing this on." Molens said McCowan, who could not be reached for comment, was defending himself and he was defending McCowan. "I’ll plead not guilty," Molens said. "I didn’t do anything." Gladney claims that it should have been a felony. Not really much new information here, other than the fact that they were willing to move forward with charges, but a trial would certainly be interesting. Update: For those keeping score, and I can tell from some of the attempted stalker-comments that some people are, this is hardly a confirmation of the tea party story. The tea party activists claimed from the beginning that Gladney was "brutally beaten," and that this was a hate crime, so the fact that the charges were misdemeanors rather than felonies means that at best the charges have come out somewhere in between what they were advocating and my skepticism. But, when you throw in the fact that wingnuts have claimed that everyone from President Obama to the director of Health Care For America Now to Carnahan's Communication Director is directly responsible for the fight, they still come out looking ridiculous. However, I'll evaluate the police report the same way any intelligent person should evaluate any purported piece of evidence: by examining what evidence and reasoning is used to support the claim. If the report comes out in favor of Gladney's story but is based entirely on the testimony of right-wing activists with a vested political interest in the story going a certain way, I will not be persuaded. Likewise, if the report came out saying Gladney was the instigator but was based entirely on Elston McCowan's testimony, I would think that it does not provide much evidence (and I'm sure you'd agree). As I mention above, I don't think much has changed. I've explained before why I'm not convinced that the witnesses are trustworthy. So I'll evaluate the evidence as it comes out. In the summary of the post, they claim that "three union thugs" were videotaped beating Kenneth Gladney. However, this conflicts with their own story, since they previously claimed that the actual beating took place before the videos. But what's really weird is that if you click on the link or go to the site, there's no story there, which means that they have deleted the original post. Wonder what's going on. Did they grow a shred of decency? Did they find new information? Did they say something illegal? For more on the story, click here, here and here.